Paint Booth – System Technologies, Inc. Paint booths provide a contaminant-free environment in which to paint. Dust and other contaminants cause bumps in the coating and can mar an otherwise sleek, smooth surface. Sprayers generally use pressurized air to atomize paint and provide a flow pattern; the paint droplets can spatter. Airless paint sprayers also can spatter which is a waste of paint and can damage other materials or cause a mess. Air currents and drafts can carry paint droplets Ventilation is also an important consideration because paint fumes should not be inhaled as they are a health hazard. They can also cause fires if not properly handled. Paint booths ensure that the painting is done in a clean environment to maximize results. Many are rectangular and have doors that can be shut to close off the booth. Stainless steel is the most common material though other sheet metals may also be used. 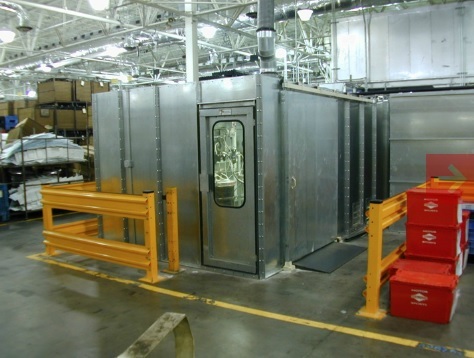 Large industrial enclosures are used for automobiles, furniture, trucks, wood finishing, industrial equipment and other items that would require substantial spray painting. A paint booth itself is a simple structure. Most are designed to be closed and have a pressurized air system that ensures that air is forced out of the paint booth and into the ventilation shaft through use of fans and compression. Too much or too little air pressure will result in poor circulation and the benefits of a paint booth will be eliminated. Air makeup units replace the air being removed from the booth and keep the pressure at a steady level. Paint booths have preinstalled compression hoses though others require the operator to use a separate compressor unit. Paint tanks provide a steady supply of paint and join with the air or compression hose in the spray gun. Some paint booths also contain heating units that bake the paint to quickly cure it before it leaves the cleanliness of the booth. Other components include control panels, exhaust duct kits and filters. Because of health concerns, paint systems and sprayers must meet specific standards put in place by OSHA, the Occupational Safety and Health Administration. Equipment and operations used in residential, commercial, and industrial applications must be approved before being sold or used. The use of face and eye protection along with a breathing apparatus such as a respirator is highly recommended and is required in most professional cases. Paint Booth A paint booth is a structure designed to keep contaminants out of the painting area while containing paint fumes and overspray. Paint booths are often used along with paint sprayers because they are more powerful, provide a smoother coating and have more dangerous fumes than other methods of painting.